I gave this book 4 stars bc it keeps the moral question and legal system in the background of a good story of real people. Paul wanted to live. Jenny did too, but she was taking him (and potentially both of them) down in the process. His health reflected his mental state as he agonized over being found out about how he survived. Not because he outright questioned what he'd done but because he didn't trust the rest of the world to accept his decision. Accept it by leaving his family and lifestyle intact. He is lucky, and knows he his blessed to have his wife by his side. If Fran stuck by her husband it could have changed everything. Together could they have pushed Paul to an edge he'd never been to? Even Reg's crazed behavior at the end fits his character and for me, didn't mitigate Paul's lie. He stuck by his own (sick) truth. What is the truth of a situation? Just the events you witness or also the motivating factors you didn't see? Can you separate the two? How do you know what you would have or would not have done in such a situation when your reasons for living are completely different from everyone else's? Or even different from your own at different times of your life. Is your whole character defined in just one moment or in how you react later? Can you separate the two?If no one saw it, then you could only know it as told to you by the parties involved. If they only want you to believe them, is that a lie...manipulation...faulty advertising...or just the truth as that person knew it? What if that person begins to question their truth? What are the right questions?I don't believe there are as many accidents in life as other people tend to say there are. That doesn't mean being judgmental about the outcomes bc I don't think you can live and make decisions if you constantly, possibly obsessively, consider every single outcome. But I wouldn't have let my kid be by herself in a kayak in freezing water while I was in a dual. I wouldn't have trusted a 13 yr old to remain in contact with a group in the fog while I followed semi-blindly behind. Is that the parents' or instructor's fault or the other thinking adult? Luckily those questions were posed by someone I was telling about the book. I didn't question it as I read bc I could see someone else doing exactly what happened. But that's what I wouldn't have done.Paul's lawyer told him to remember his outrage. Could Paul have told the truth with love? He didn't trust our "spiritually empty culture" ( p.314) to hear it with love. As Reg asks on p. 248, "Why does the truth never taste this sweet?" 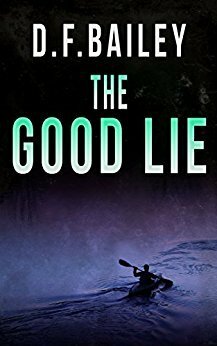 Given To Me For An Honest ReviewThe Good Lie by D.F. Bailey is a must read. Although is starts slow it will grab you and hold you on the edge of your seat as you see the pages turn, and turn, and turn then turn some more. All of a sudden you are taken away and you feel like you're part of the story. It is about a horrible kayaking accident. Paul wanted to live, so did Jenny. Paul agonized about being found out about what he had done to survive. He had a moral dilemma. You will be experiencing that moral dilemma even after you finish reading the book. This is an intriguing story. I really enjoyed reading it. I had a hard time putting it down even for a little while, it's that good. I gave this book 5 stars but it really deserves many, many more. I highly recommend this book to everyone. I look for more from D.F. Bailey. I received a copy of this book in exchange for an honest review. The book started a little bit slow for me, but once it picks up, the suspense does as well. The premise in a nutshell is, would you tell a lie in order to alleviate someone's personal pain, and what are the repercussions for doing so? Very well written, making me feel as if I were part of the story itself. Will definitely read more from this author.